Recent government figures show homelessness is on the rise. Carlisle Key on Fisher Street aims to keep local young Cumbrians off the streets. The charity helps 16-25 years olds live independently by providing advice and guidance through its drop-in service as well as one-to-one support. A dedicated staff member with a team of volunteers offers help and advice on housing, benefits, debt and related issues. Many youngsters have a wide range of needs and can include issues relating to mental health problems, drug and alcohol use, and domestic abuse. Some are young offenders or ex-offenders, care leavers without support or otherwise involved with children’s services, have absent parents, learning difficulties or for a range of reasons are not in employment, education or training (NEETS). A lot struggle with mental health problems. A referral to the Community Mental Health Team can take six to eight weeks and during that time their condition can get worse. 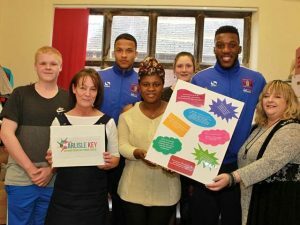 The charity started offering a counselling service as it found young people were much more willing to speak to someone in a familiar environment but needed additional funding. A grant of £26,626 from the Cumbria Young People’s Fund has enabled this service to continue for the next three years. The funding also contributed towards the charity’s outreach service, working with youngsters in their own homes helping them to maintain their accommodation by giving them additional support which was previously lacking. Claire Brockie, Project Manager, said: “A young girl, with a history of abuse in her family, was unemployed and had a one year old child. She was struggling to deal with the stress of her situation, and felt things were spiralling out of control. Carlisle Key booked her an appointment with a doctor and continued to counsel her. She learnt how to develop coping mechanisms and went on to attend a full-time hair and make-up course at college which, after a work placement arranged by Carlisle Key, led to a part-time job. Other services provided by the charity include washing and cooking facilities, practical guidance on baby and child care, phone and internet access, mentoring and referral to other services and agencies, employment advice, computer skills, form filling and writing CVs – all crucial in helping the youngsters becoming independent and self-sufficient. Carlisle Key celebrated its twentieth birthday in 2017. In that year it also worked with 266 young people who were either homeless or at risk of becoming homeless, and 2,797 attended the drop-in sessions.